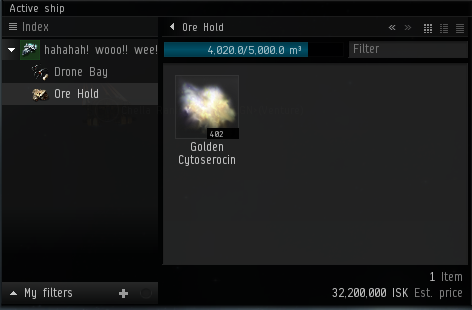 I said that this deployment I was going to make ISK. Making active ISK in game is something that I miss. 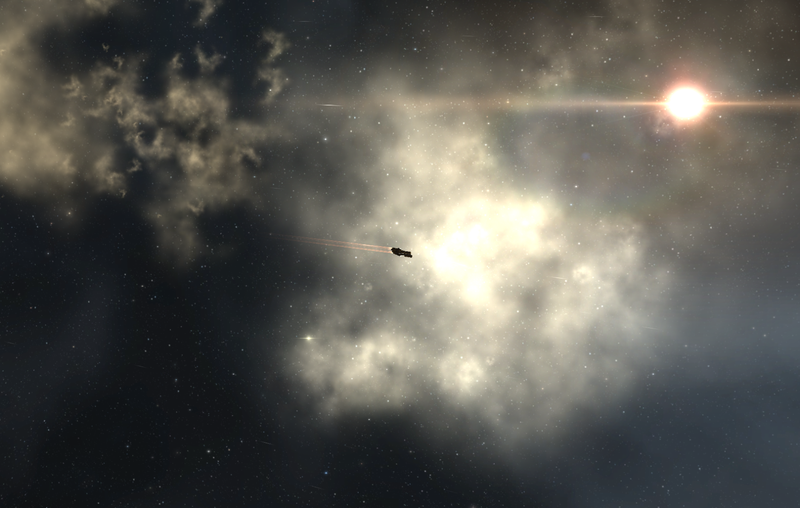 While I love my market and logistics I really enjoy the video game part of Eve. I'm a resource gatherer at heart and while it is wrong and evil and should never be spoken about, I've always enjoyed those aspects of Eve. One thing that sprung to mind that I completely missed out on in Syndicate was gas harvesting. If you think mining is boring, gas harvesting is even worse. However, it is something very close to my heart as a booster manufacturer. I've never been able to thin down prices on boosters using the 'my time is free' model because Molden Heath only makes Sooth and Sooth is not commonly used. When I learned that the local gas would be Golden Cytoscerocin and other such goodies, I was excited. The boosters that I make are made with these gases. Plus, simply, ISK making is ISK making. The Venture is a wonderful gas boat. People comment on this now and then and I will add to it. Gas goes into the ore hold. It is bulky as is ore. It used to be that one would use a cruiser or battlecruiser with as many high slots as possible to scoop gas. While useful still, the natural agility, ore hold, and bright yellowness of the Venture makes it the best thing for the job. Plus, it is cheap. It costs a fifth of the gas harvesters installed upon it. So, when I was about to start the first stocking run for the market, Altaen handed me a bookmark for a gas site in our local system. This is when you know they love you. I was super excited and totally doped up on cough suppressants. Mining gas was the best thing I had ever heard of at that time. Of course, I was not yet set up for it. The Venture is so ridiculously cheap that I decided it would be a waste to move any from Molden Heath when I could just buy a new one. I just had not gotten to that point yet and with the bookmark burning a ISK shaped hole in my hand I undocked Chella and darted off to high sec to secure myself a Venture and some gas harvesters. About that point I decided that screaming in alliance chat that I was the best gas mining frigate "EVAH". Somehow, all caps and pure joy at gas harvesting made complete and total sense. Damay was kind enough to indulge my bout of insanity in alliance chat. With only 7-2 in the alliance we don't actually use the channel so it was fantastic for my... uhh.. issue. It took me an hour to harvest the two gas clouds. I harvested 4,020 m3 of gas which was 402 units and my cargo estimates it at 32 million. So, 32 million for an hour of gas harvesting that I wasn't paying attention to with 200k invested for the Venture and 5 mil for the harvesters. Not bad. Of course, full of freshly harvested gas and joy I realized that the system chosen as our temporary home is a .04. Huh. Well. If I am to put a POS up it will have to be in a neighboring system. Bleh. My entire POS idea is crumbling around me. I picked up Gas Harvesting once but never found one of the rich clouds. I think I'll try again. Sorry to hear about your winter lurgy. I too have this. Ahh! You mentioned my name! Am I famous now then? You'll have to find a famous blog firs, pet. Gas mining in Anoikis is the BOMB. Period. IN SYJ we ahd a Mumble chan JUST for the venture Fleet and at the call of a "Vital" being out there and there was almost always a rush... Vital Cores in C6s have C320 & C540 gas (WOOHOO!) and the added bonus of the L&S from the 4 Sleeper Battleships and 4 Frigates too boot! It is important to also realize that the gas fitter is responsible for the installation of new gas appliances.